Sediver insulators in both the 40,000# and 30,000# rating. The dead end strain insulators require additional mechanical strength whereas the "idler string" supporting the conductor jumper below the arm requires 30,000# bowl shaped suspensions. Crews here at Northwestern Energy change out dead end bells "hot" at 500,000 volts using the bare hand method. The Sediver Insulators (green and clear glass) are still actively being used all over the US. These are referred to as "toughened glass" insulators and have many advantages over porcelain. These are some pictures of strings made by Sediver of France used on 500kv dead end on two lines in Montana (Northwestern Energy). Bonneville Power Administration has literally thousands of circuit miles of 500kv line and much of it is toughened glass. 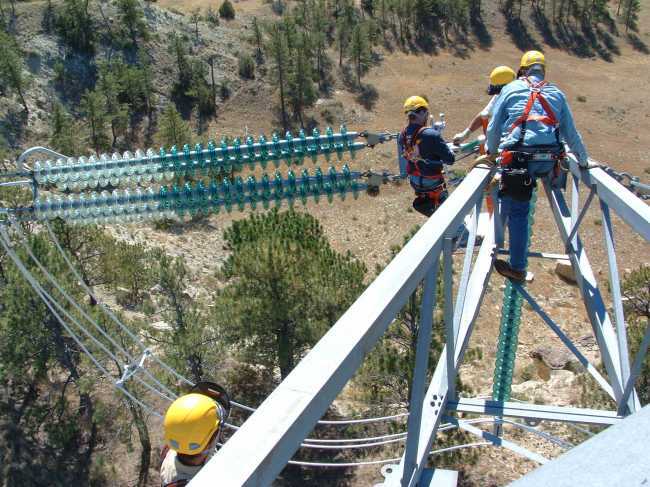 An interesting note about the difference between glass and porcelain, is that when they are being changed out (as the photo shows our team doing here near Billings, MT) the glass strings do not need to be sent to the ground for dielectric testing like porcelain bells do. Here, only the individual damaged "bell" is removed and replaced while strain is released. With porcelain, the entire string must be sent to the ground and each bell or set of bells must be tested on either side of the damaged unit. Historically speaking, glass was considered mechanically inferior to porcelain. Quality of glass in those early years contributed to this fact, but in recent years, tempered or toughened glass has produced a very durable and mechanically reliable tensile strain insulator (suspension or dead end). The bowl shape or multiple petticoat bells are used in differing areas of this 500kv power line and is indicated by the amounts of "strain" on each string. Hence, you can see the bowl shaped Sedivers used in the photo as "idler strings" at the dead end on the right side under the arm. These are rated at 30,000# and would certainly be well and fine for lesser strain dead ends or tangent transmission lines. Note the other bells in both green glass and clear glass for the high tensile force of these dead ends. They are rated at 40,000#, and it is obvious, I think, why. Both are mixed in this photo, because Northwestern Energy upgraded a 230kv line to 500kv in the late 70's and these clear glass strings happened to be added to the green ones to form the perfect 24 bell dead end string. Both are still available to my knowledge.